BENGALURU: Bengaluru FC averred their pedigree as Title aspirants and showcased that the Hero I-League pedestal was still far from Mohun Bagan’s taking as they decimated Kingfisher East Bengal 3-0 on Sunday (May 3, 2015) at the Kantaveera Stadium in Bengaluru. The ‘Boys in Blue’ took an early lead in the 31st minute when Sean Rooney evaded his marker and timed a sweet volley, which crashed into the back of the net. The I-League Champions doubled their lead in the 60th minute when Captain Marvellous Sunil Chhetri produced a thunderous header, following a pin-point Eugenson Lyngdoh cross, which blazed past Abhijeet Mondal. Robin Singh provided the icing on the cake and scored a sublime goal in the 89th minute to grab all three points for Bengaluru FC. Coming into the match Bengaluru FC’s gaffer Ashley Westwood opted to start with all four foreigners available – Curtis Osano, Joshua Walker, Sean Rooney and John Johnson. The strike force of Sunil Chhetri and CK Vineet, powered by the industrious legs in midfield of Eugenson Lyngdoh provided a framework for the Home Team to match their opponents, who have imitated a Dutch-style of Football. The harbinger of Dutch football in East Bengal, Eelco Schattorie, included Avinash Rui Das in the starting lineup, whilst old war horse Arnab Mondal was replaced by Deepak Mandal, due to injury. Both Team indulged in an end-to-end stuff from the early minutes of the match and did sheer justice to the hype of the match. Dudu’s constant pressing and harassing of the Bengaluru defence almost provided dividends for the away Team in the 4th minute, when Rino Anto failed to control a backpass, fostering an opportunity for the Nigerian striker, which however was sweeped clear by Ralte. Seven minutes later the Nigerian striker once again got into the thick of the action and lined up a shot, which flew wide of the post. Bengaluru FC meanwhile were garnering their own opportunities, which although came in plenty, lacked the pivotal touch in. CK Vineet’s long ranger in the 15th minute did little to trouble Abhijeet Mondal as Bengaluru FC started to roll their juggernaut. Minutes later Sunil Chhetri’s stunner-of-an-attempt was saved acrobatically by Abhijeet Mondal, as Bengaluru FC started to gear up their ante and dictate the pace of the match. Albeit East Bengal dominated possession, it was their opponents Bengaluru FC who registered more shots on goal and lead 1-0 at the Halftime. The second Goal in the 60th minute insured Bengaluru FC that all three points were of their taking. Nevertheless, the Blue juggernaut continued to roll and gather momentum with every passing second. Robin Singh came close to tripling Bengaluru FC’s lead, when a dazzling run on the right asphalt by Eugenson Lyngdoh, was scooped over the post by the striker. With three points close to secured the home Team sat back and allowed their opponents to dominate possession and control the flow of the Game. The Red and Gold brigade came close to halving their deficit in the 80th minute when a panoply of exquisite passes saw a well-timed cross from the right flank, and had Dudu been able to connect with it, it would certainly result in a goal. 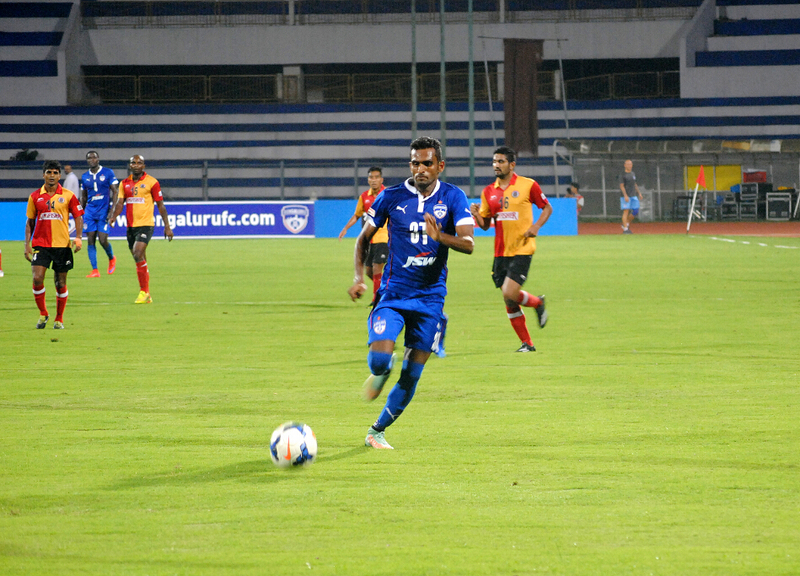 Nevertheless, East Bengal were handed another attempt to halve the deficit minutes later when Harmanjot Khabra’s cross was met by the bombarding header of Dudu, whose attempt was saved acrobatically by Ralte. After increasing their goal difference in the 89th minute, the I-League Champions toyed with the ball and thwarted away attacks on their citadel. Bengaluru FC averred their pedigree as Title aspirants and showcased that the Hero I-League pedestal was still far from Mohun Bagan’s taking as they decimated Kingfisher East Bengal 3-0 on Sunday (May 3, 2015) at the Kantaveera Stadium in Bengaluru. At the end of ninety minutes the scoreline read 3-0 in favor of Bengaluru FC as they continue their surge upward in the Hero I-League table.